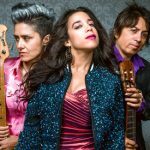 Toronto Urban Latin ensemble and winner of the title of Best of ‘Play the Parks’ in 2017, continues to fire up funk fusion with their new video and single “Hurricane” released August 2018. The word “Santerías” represents a cultural fusion where dance and music are fundamental ingredients for healing. 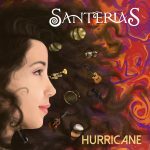 Santerias Band proposes that their dynamic and upbeat style of music, coined by them as RUMBAFUNK, should be a universal healing language. Some songs bring in Latin rhythms while some embrace a Brazilian Tropicália sensibility, but all of them get bathed in a vibrant mixture of pop and funk aesthetics. 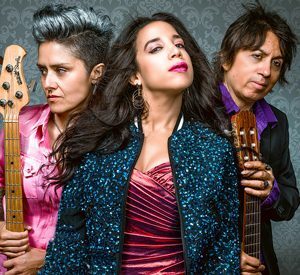 Ana Lía Arias Garrido (Dominican Republic) on lead vocals, Juan Dino Toledo (Chile) on guitar and backing vocals, and Oriana Barbato, (Chile) on bass and backing vocals, are the core of this musical superpower. They have a roster of guest musicians and most recently, Randolf Jimenez (Venezuela), has been put in charge of the rhythmic backbone. Santerias release their fourth album by the fall of 2018. Their new single “Hurricane” will surely blow you away!